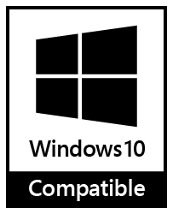 EasyPackager MSI creates standard Windows Installer, or MSI, files, as opposed to oddball executables that other packagers might be using. 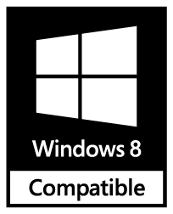 The resulting installers, with the addition of code signing, should pass the Windows App Certification Kit tests, meaning your desktop app can be potentially declared as "Certified for Windows." Project information is laid out in a simple, tabbed interface. Filling in basic information is quick and simple, and EasyPackager attempts to provide sane default to improve efficiency. 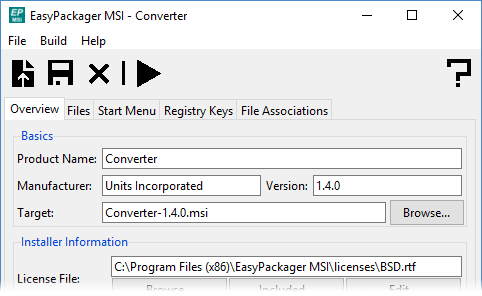 Included in EasyPackager's documentation is a quick-start guide that will illustrate building a basic, but feature-complete, Windows Installer in a handful of steps using EasyPackager MSI. Adding links to your executables or other files is as simple as selecting a project file and providing a label. Website links can also easily be added to the Start Menu with comparable ease. EasyPackager MSI provides a clean interface for associating certain file types and extensions with your application. 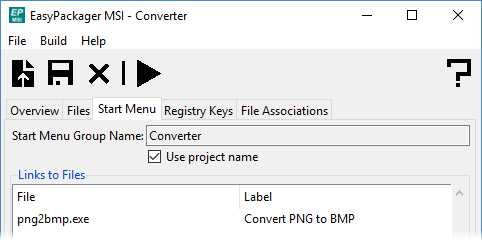 Entering an extension and selecting an executable within your project are the only two steps necessary to creating installers that include file associations. When a code signing certificate is available, EasyPackager MSI can be configured to sign the installer once the project is packaged. Support for timestamping is present as well. Additionally, EasyPackager can be instructed to apply the same code signing to all executables and dynamic link libraries within a project, alleviating this potentially tedious step from the developer's workflow.